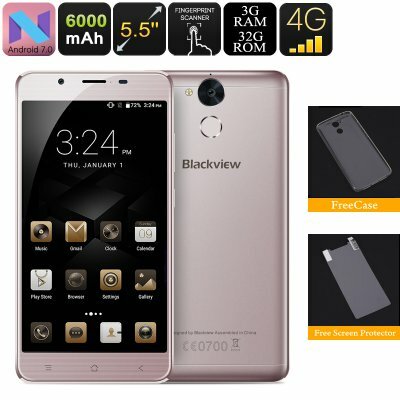 Successfully Added HK Warehouse Blackview P2 Lite Smartphone - Octa Core CPU, 3GB RAM, Fingerprint Scanner, 6000mAh Battery, OTG, Android 7.0(Grey) to your Shopping Cart. The Blackview P2 Lite is a large screen Android phone with a lot to offer at an exceptionally low price. With Octa core CPU, plenty of RAM a fingerprint scanner and huge 6000mAh battery you get a lot of bang for your buck with this remarkable android phone. The 5.5 inch display serves up so stunning images thanks to its full HD resolutions. At 5.5 inches its larger than the average phone and the extra room makes it a nice size for movies and games as well as surfing the web. Covered by a 2.5D arc glass and with a metal frame the phones body has a smooth premium feel which is a nice detail at this price level. Boasting an Octa Core CPU and 3GB of RAM as well as the Mali-T720 GPU the L2 Light smaryphone is well equipped for movies, games and multitasking so you can enjoy them all without any lag or stutters. There is 32GB of onboard memory that can be doubled via a micro SD card so you'll have enough storage for hours of movies and music as well as a huge selection of Apps and games. Tipping the scales at 230 grams the Blackview P2 Lite smartphone is a little on the heavy side but considering the phone is packing a 6000mAh battery its perfectly acceptable. This large reserve of power mans you can use the P2 Lite as a power bank to charge up other phones and gadgets and with such a large capacity battery you can get days of usage from a single charge. With 2 SIM slots and 4G supporting for for B1, B3, B7, B8 and B20 bands the phone can enjoy the fastest mobile internet speeds in many regions of the world. You can manage two number simultaneously so organizing work and private contacts can all be done on the one device. To the rear of this android phone is a 13MP camera so you cna shoot high resolution photos and record video in 4K.